After surfing the net, being addicted to Pinterest, and reading all about what my fav bloggers are doing, I had to decide on my new theme for my classroom. I was very much influenced by two of my best friends, Rosie and Sonia, to do the owl theme. They did it last year and are keeping it for another year. It didn't help that Pinterest has been swarming with cute ideas and resources, so I made up my mind and finally took the plunge and went shopping at Lakeshore Teacher Store. That is such a dangerous store for me. I got borders, stickers, a calendar set, nameplates, helper set, and other owl decor. I have also bought other resources from TpT. Once they are in place, I'll take pictures and update my post. Now on to two really cute items I created. 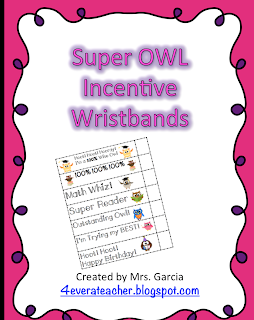 The first is Super Owl Incentive Bracelets. I have seen a couple versions of these on Pinterest, but I "needed" to have an owl theme one--therefore I created it. I plan to run the sheets off on color, heavy stock paper for my kiddos and hand them out when they show growth or score 100% on assessments. 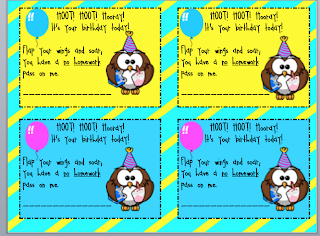 I included the owl incentive ones and I also included some with reminders that I know will come in very handy with students that struggle to bring back items or inform their families of important information. Click on the pictures below to see more. Item #2 is a Birthday no homework pass. Of course it is also had to be owl theme with both color and B&W options for printing. I am a fanatic of pencils. I do one for my kiddos for every holiday or big unit learning. It is therefore natural for me to attach it to a special birthday pencil. My kiddos love to receive pencils, and they especially like the day off from homework. I will place pictures of my pencils once I complete them. To get your copy of these passes, head on over to my TpT store or click on the picture below. 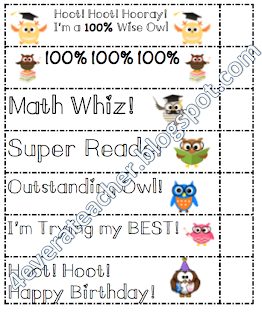 If you are in search of a plethora of Owl ideas, resources, and templates, follow my Owl Ideas board on Pinterest. I am constantly adding to it. What theme or color scheme are you doing this year?